I will definitely register for the 5K and the new 10K race. 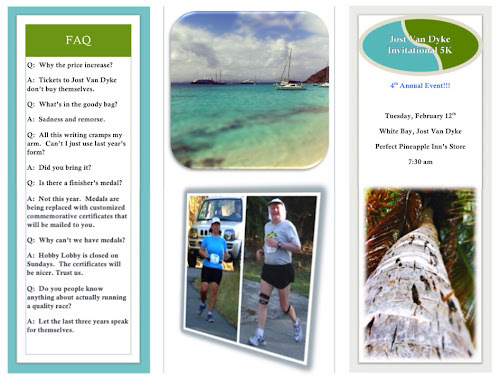 I was actually thinking about adding on the half marathon again as well. I know I complained about it in January and said I was "done with this nonsense", but time and circumstances have brought some perspective. 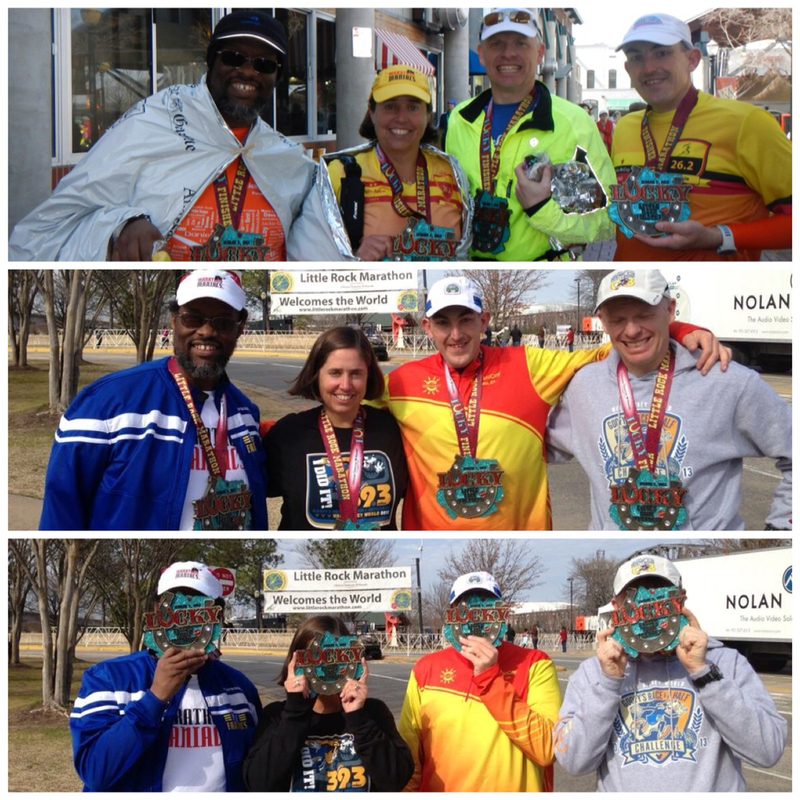 First, I've completed two half marathons already so I don't have to prove to myself that I can cover the distance. Next, I can go slower and take all the pictures I didn't take the first time around and do some more fun filming on the course (and use my new GoPro) rather than worry about my time requirements for the Coast to Coast Challenge. Finally, it was announced this is the last year Team AllEars will be in existence so I kinda would like to be out there with the larger group that morning and commemorate the last 3 years (5 for Holly). 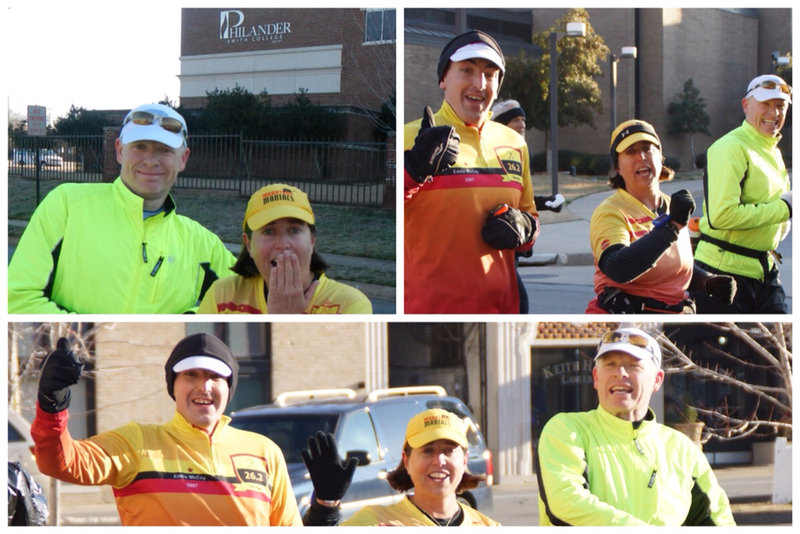 Without Team AllEars we would't have started Team Tizzel. I was willing to accept the downsides: rigid workout schedule, training in general, and exercising while on vacation. But then that all changed last Sunday (March 24). 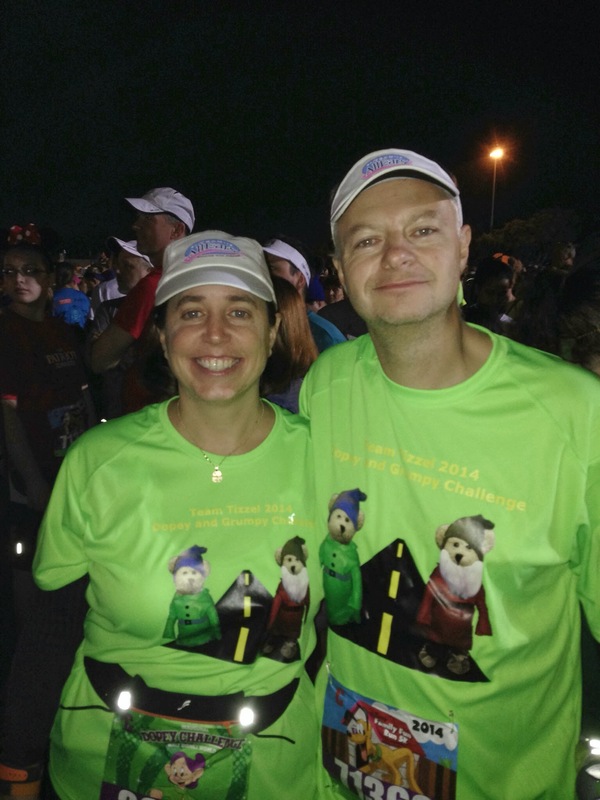 Holly and I went to Chicago to do the Chi Town 10K (me) and Half Marathon (Holly). Describing the day as cold and miserable would be the optimistic point of view. It was nastiness only The Devil could conjure. 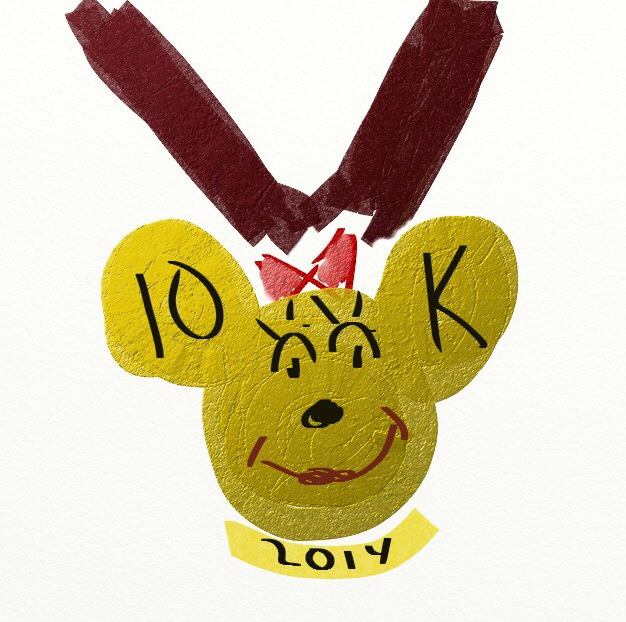 To add insult to it all we had to restart the 10K. Volunteers were given bad instructions and sent us the wrong way on the course. They pulled me off the course when I was 1.4 miles into it. We were sent back to the start to do it all again. After completing a total of 7.6 miles I was directed to the stage to wait for an announcement from the RD. Standing out there in my sweaty race clothes was awful. After the announcement I went back to the car and just sat and shivered like crazy for ten minutes. I could potentially see these conditions, or worse, in December and January when longer training distances are required. Holly had a good day out there. She was cold just like I was, but she had a great finish time and felt pretty good afterwards. 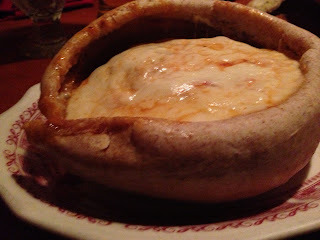 We finished our time downtown with a great lunch at Chicago Pizza and Oven Grinder. Their Pizza Pot Pie is a one-of-a-kind. 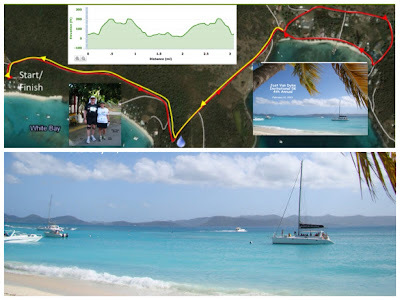 For the last ten years we've spent a week of vacation time in the British Virgin Islands on the island of Jost Van Dyke. The population there is around 300 people. 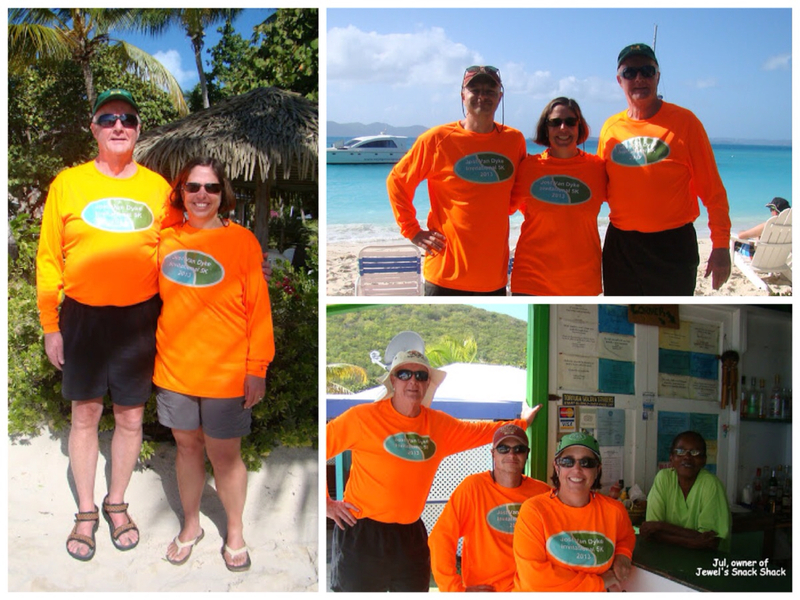 Over time we've formed friendships with locals and other vacationers that visited each year at the same time we do. In 2010 our friend Dan was selected by his running club to receive an entry into The Boston Marathon. This was a sort of "hall pass" to bypass the qualification requirements. In order to help him train while on vacation, we developed the Jost Van Dyke Invitational 5K. Holly and Dan were the only two competitors. 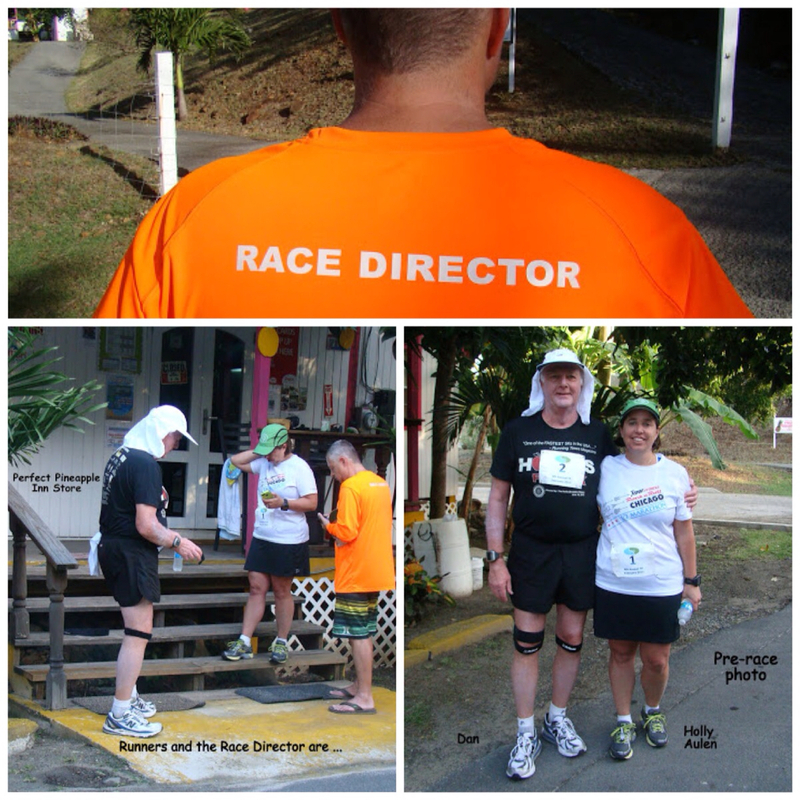 We provided race bibs, entry form / event guide, t-shirts, and medals. The race holds some traditions in-place: the time and day of the week, race course, and post-race breakfast. 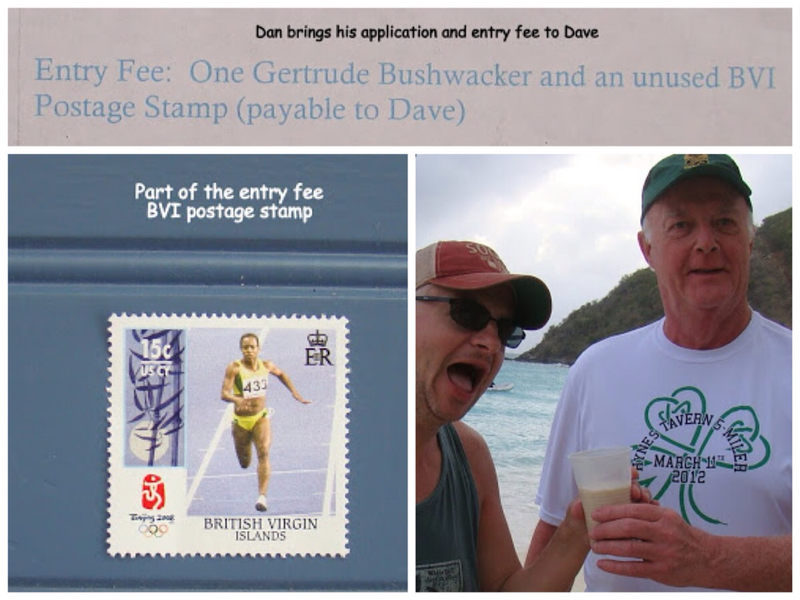 But many things have changed too: This year we replaced medals with more natural tokens (which were left on the island - ingrates) and race certificates (soon come). We created a permanent race logo last year that still goes on all media and wearables. The wearables have improved too. We went from iron on t-shirts to long sleeved printed tech shirts. Of course, the race fee went up too. On race day the Race Director, runners, and MaryJo (Dan's wife and race photographer) all gather in front of Perfect Pineapple's Store. While runners are corralled up they typically complain about the heat and hilly course. 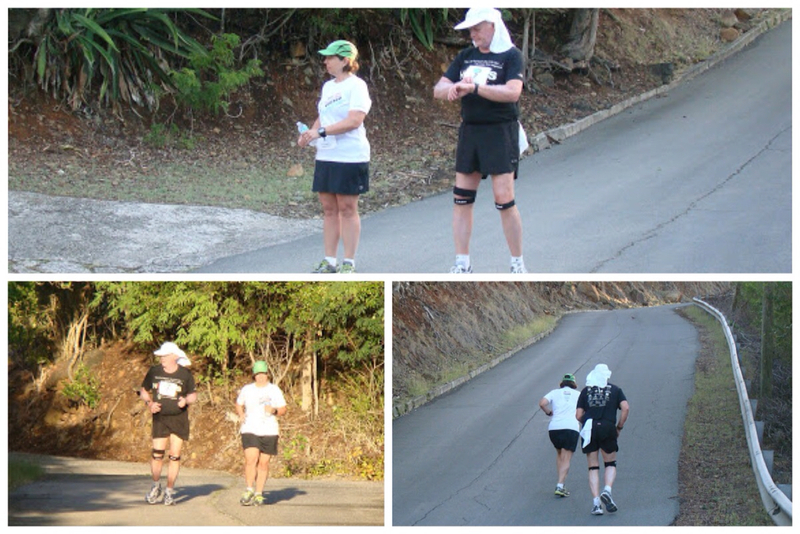 MaryJo does a great job capturing all the action in jpg while the RD tries to see how many video angles he can line up. 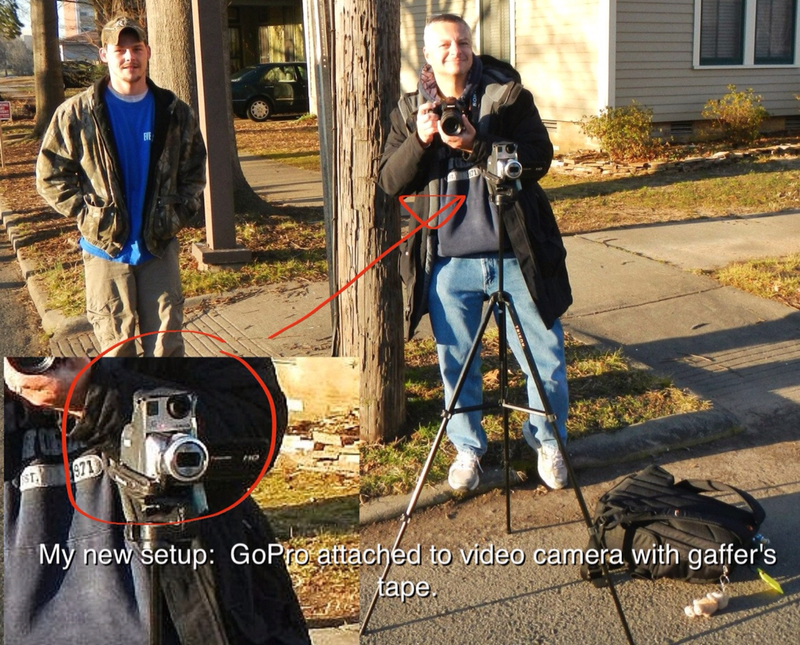 If it wasn't for a dead GoPro battery it would have been four angles..... This year we had an extra spectator at the start line. A French guy on his way to town stuck around to watch the fun. Once the race began MaryJo headed up the hill to take more pictures while Dave just sat on the stoop and played Candy Crush. The runners found another ACTUAL spectator on the course. A guy we met the day before at a bar. He did not believe the race was real so he stumbled out of his villa to check. Boy was he surprised. We don't have fancy bib tags for this race to track the location of our runners. 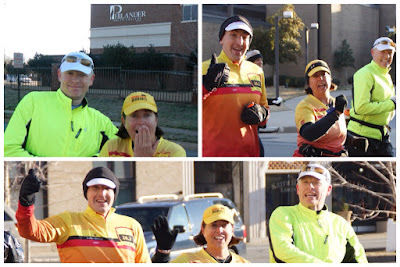 We rely on the local cabbies and folks driving to work to post us on the race status. One person even informed us that Team Tizzel was in the lead! 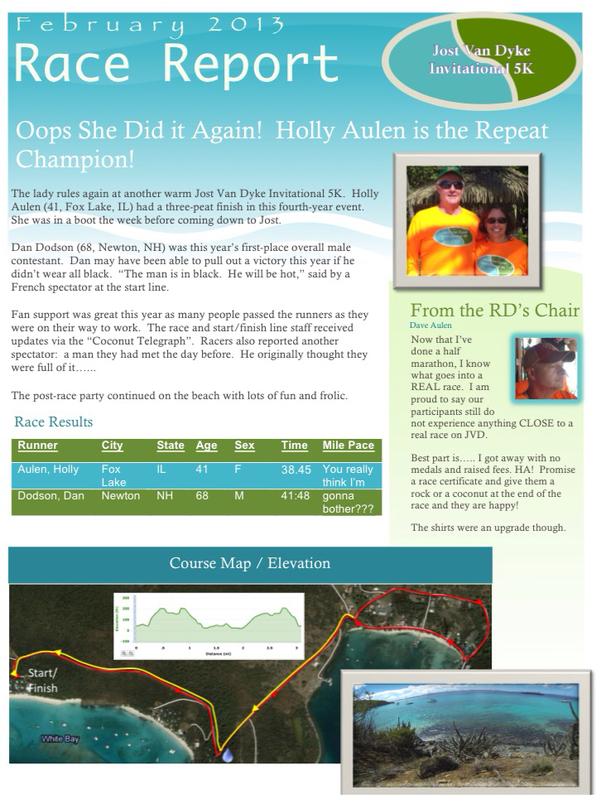 Holly crossed the finish line first in under 39 minutes with Dan not too far behind. This was Holly's third overall victory and Dan's fourth consectutive overall male finish (plus he had an overall win in the inaugural event). Once all the athletes had a chance to cool down we hold the award ceremony and then send them to the showers before breakfast begins. Later in the day race shirts are worn for the afternoon pub crawl. This year some lady from Canada bought us a round. Sweet! Here's our video from the race, the registration form / race guide, and the race report newsletter we send out when we get back home. You can click on the images to make them a bit clearer. For some Walt Disney World fans one of the most iconic images of the parks is the Walt Disney Wold Monorail. It's part transportation, part tour guide. 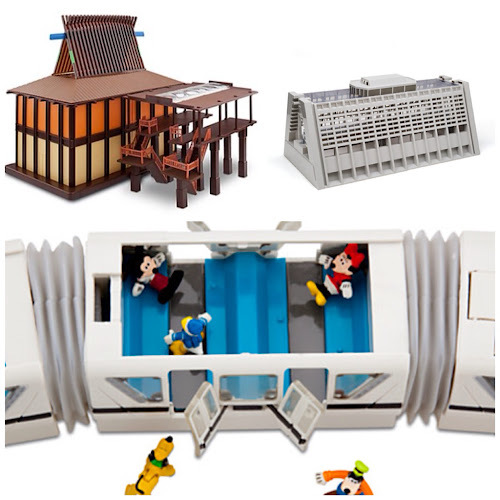 During our last long trip to WDW we bought the Monorail Playset along with the add-on Contemporary Hotel. 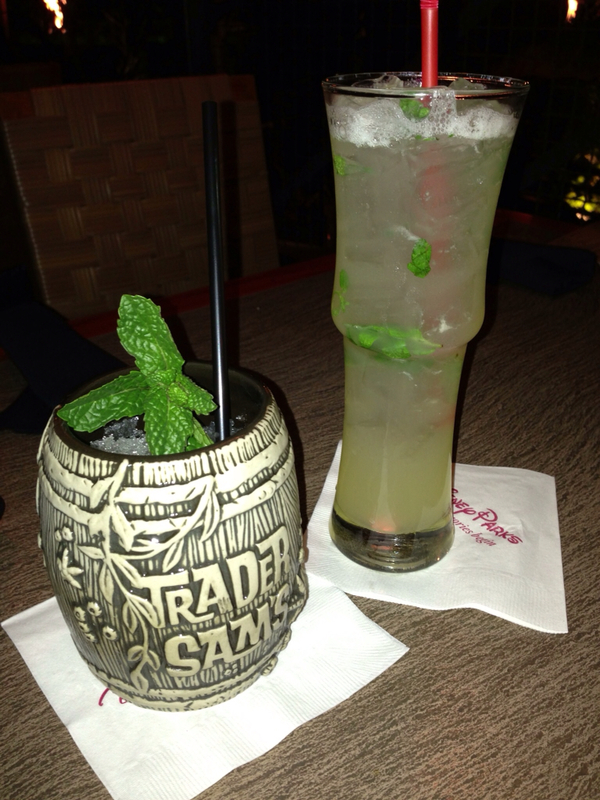 Eventually we added on The Polynesian. 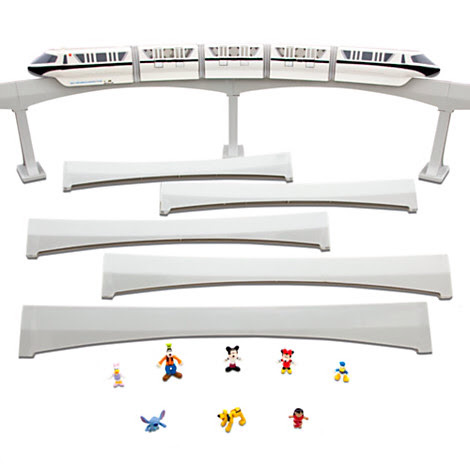 Our version of the set (not the one pictured here) is Monorail Blue and came with some different figures than the ones pictured with this set. We have Br'er Rabbit and Mike and Sully from Monsters, Inc. The train is battery operated. You move a switch to turn it on to go forward, or move the switch the other way to go backwards. There's headlights. Portions of the Monorail spiel plays at random intervals, or can be played by pressing a button on the top. The doors and roof open so you can play with the figures, or just throw them all in because they just fall down anyway. The Disneyland version of the toy is remote controlled. Here are two short videos. The first video we shot with the GoPro one afternoon and the second is a video we found on YouTube of a more complete set. Still catching up..... We had a whirlwind trip to Disneyland in January to participate in the Never Land 5K and Tinker Bell Half Marathon. Along the way we did a bunch of park touring in a very short amount of time. We really crammed it in on this trip. Pictures are scarce because we ran around so much and forgot to take them. Our first night on-property we had dinner and drinks at Trader's Sam in the Disneyland Hotel. Dave's cousin and her boyfriend met up with us and we sat outside right in front of the Hawaiian band. Seating both inside and out was tight so we had to hover to get a table and guard our unused chairs (waiting for our guests) with our lives. Good specialty drinks and appetizer-type items. Lots of hidden Disney jokes inside the bar. The night before the half marathon we dined at Naples (same owners as WDW's Via Napoli) with our friends Gail and John. While here we tried (and enjoyed) the Red Trolley Ale. Holly and I had to carb load so we had generic pasta and meatballs. Some other dining: drinks at the outdoor bar attached to Catal in Downtown Disney, beignets and mint julips in Disneyland, Hagen-Daz cones, drinks and breakfast at Cozy Cone, lunch at Flo's V8 Diner, lunch at Cucina Cucamonga, lunch at Bengal BBQ, hand-made ice cream bar at Clarabell's, and several beers from the Pacific Wharf beer cart. 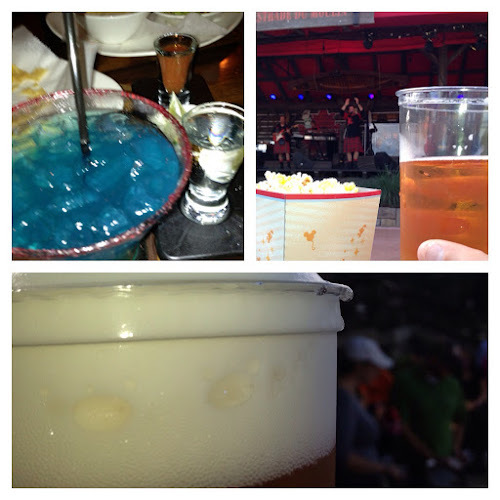 We signed up for The World of Color dinner package. By signing up to eat at a particular restaurant we were able to earn reserved standing area passes for The World of Color Show. 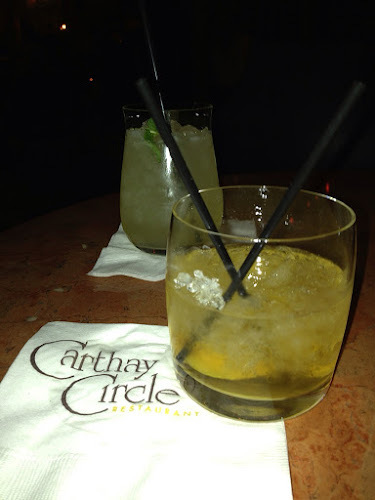 We chose to eat at Carthay Circle. Even though we had a reservation we were given a hard time by the door lady when we tried to get in early for drinks at the lounge. "Oh it's so crowded in there I don't think you will find a seat" is what we were told. No problems.... Very nice and comfortable lounge. The dining area was also very nice - reminded us of WDW's Brown Derby. Food was very good. On this trip we spent most of our time in Disney's California Adventure Park (DCA) instead of Disneyland (or as we call it the "prototype Magic Kingdom"). 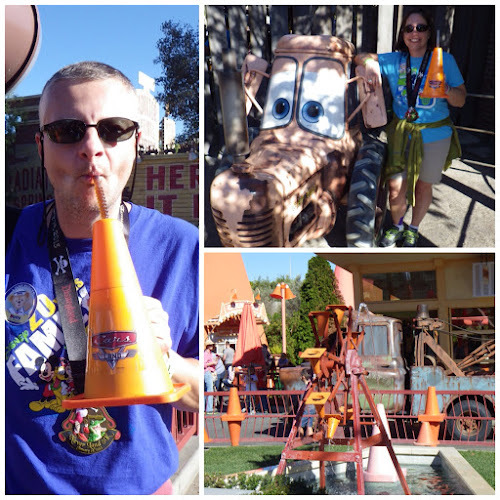 We wanted to dedicate a lot of time to the new Cars Land. 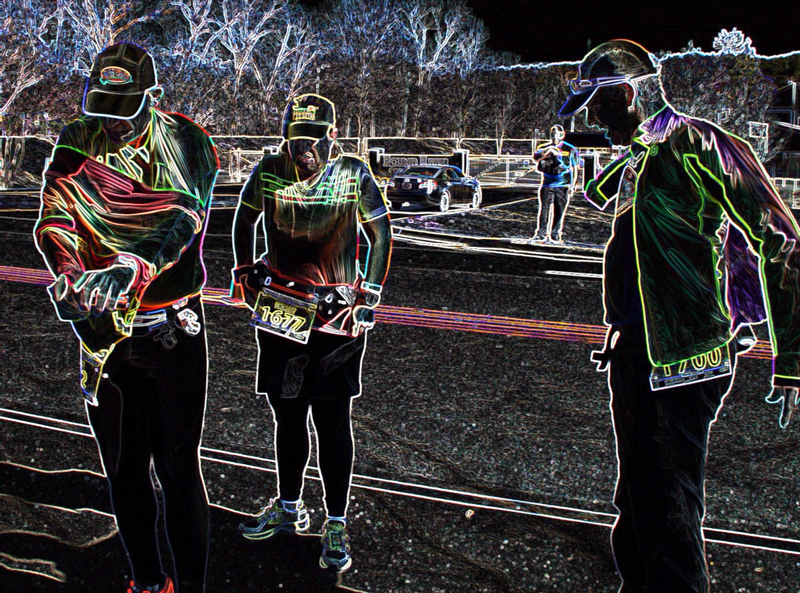 Our first glimpse of this area was just before sunrise during the 5k and it was impressive. Very detailed recreation of Radiator Springs. 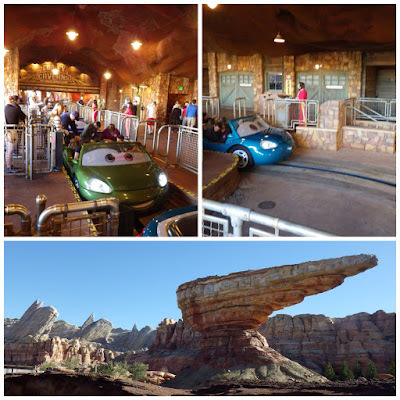 The highlight of course is the e-ticket Radiator Springs Racers attraction. Great modern attraction. There were two other rides: Mater's Junkyard Jamboree and Luigi's Flying Tires. Both are cute but not worth a longer wait than ten minutes. 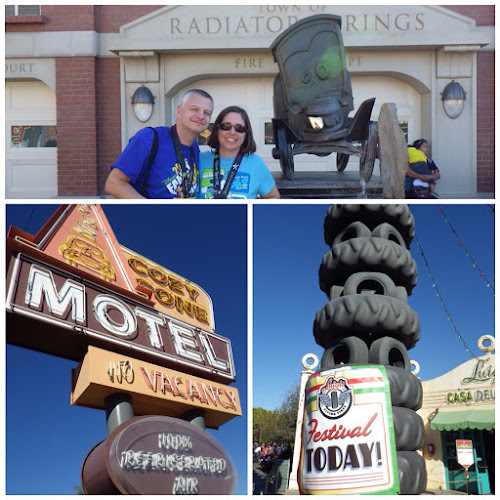 We liked all the Cars-themed shops, Flo's Diner, and Cozy Cone Motel (counter service). We finally got to ride Haunted Mansion (refurb last time we were here). We saw the return of Tiana's Jazz Show for Limited Time Magic. We rode the Matterhorn with it's new seating configuration. Holly said it reminded her of a gynie visit. The Christmas overlay was still up for It's a Small World - We loved it! This ride is so much better here vs. Disney World. Disneyland was crowded that Sunday so we ended up skipping a lot of attractions - we didn't even go into Tomorrowland. We were in WDW the week before so we felt like we weren't missing much overall. We may have really wanted to celebrate the end of the Coast to Coast Challenge with some other snacks and beverages not found in Disneyland. In DCA we spent a lot of time in Paradise Pier. We rode California Screamin' a few times and enjoyed some good bench time with snacks. We watched Minnie's Sky School show and saw the tail-end of the Carthay Circle Jazz Show. We saw the beginning of the Mad T Party. Didn't get why they mixed techno decor with hits from the 80's. We watched the Wilderness Explorer's badge presentation with Russell. We thoroughly toured all the new Buena Vista street shops and put the cast to the test when trying to get change for a dollar. The Little Rock Marathon has been on my radar ever since I started this 50 states quest. 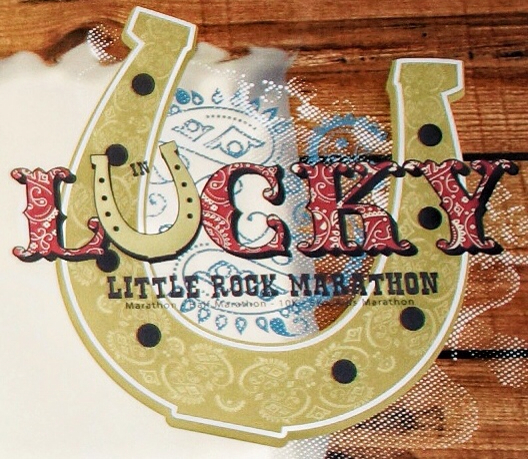 I heard about the humongous medal and knew that this would be my marathon for Arkansas. 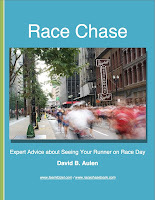 Joe Taricani, from The Marathon Show, ran this one last year and did a great job of describing the race. After hearing his show I knew I was in for 2013. Unfortunately, I have been nursing a Plantar Fasciitis injury since October. 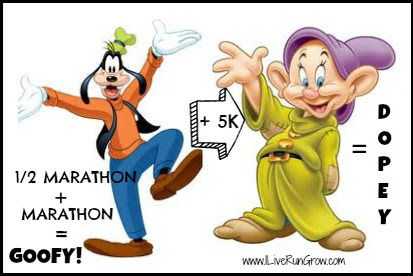 I finally went to the doctor in January after the Tinker Bell half. He thought it was a stress fracture, but luckily it ended up being severe PF and an inflamed heel bone. He put me in a boot for a week and gave me a cortisone shot in the heel. 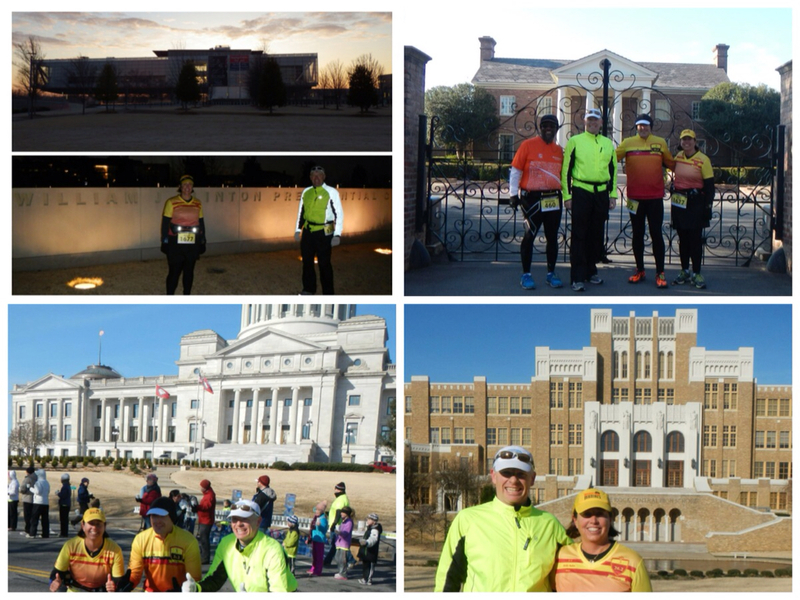 This was four weeks before the Little Rock Marathon. I was sure there was no way I could do the race. Thankfully, I have good friends who were going to be at the race and they talked me into going. I did a 5k test run two weeks out and it felt good. We bought our plane tickets and we were going to Little Rock. 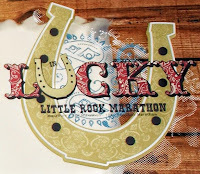 With very little training I knew I should switch to the early start that the Little Rock Marathon offers for people who will need more than 6 hours to complete the race. I wasn’t sure how long it would take me since I had done little training since January. I was able to get the early start and attended the mandatory meeting during the expo. The early start begins at 6 am and the regular start begins at 8 am. Early start runners are not allowed to pass the 6 hour pace team until the elites pass the pace team - around mile 14 or 15. We got into Little Rock Friday night. We were meeting our good friend “Fast” Eddie McCoy. Our other good friend Michael Miller would be coming in Saturday afternoon. 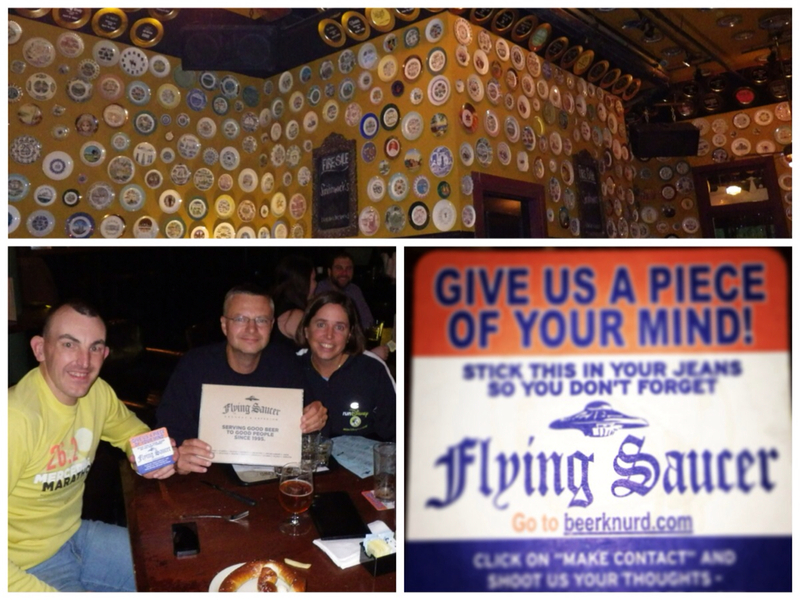 We hit The Flying Saucer bar that had a ton of beer choices and we had a great time! Saturday was the Expo. After our first visit we met Eddie's friend Richard Peete (who lives fairly close to us) and we all went to lunch at Bosco's Brewery. Great food and lots of laughs. Later at the Expo Eddie and Michael both decided to do the early start with me (Richard was already signed up). I couldn’t believe it. They are both well under sub 4 hour marathoners. Eddie has qualified for Boston and a 6 hour marathon for both of them would be a long day. I was happy for the company, but worried they would be so bored with going so slow. We got up early for the start and headed over to the Perks Tent (an add-on pre and post race VIP area). It was nice to grab some food and drinks before the start. It was cold morning, about 28 degrees or so, and we were freezing. The early start was like a regular start with the National Anthem and a countdown. We started back a bit from the 6 hour group because we didn’t want to be bunched up with everyone. I had decided to do a 2:1 Galloway interval instead of my usual 4:1 to try and save some energy for later in the race due to my lack of training. The course was nice. It took you by all the sights of Little Rock: The Clinton Library, Governor's Mansion, Capitol, and Central High School (an important site in the civil rights/desegregation of schools movement). Yep that’s pretty much it. Eddie and Michael were great pacers, but even better company. Michael always kept me laughing and entertained. Eddie would run ahead and take our pictures and take video of us running by. He would text Dave to find out where he was on the course. He was like my own personal running concierge. 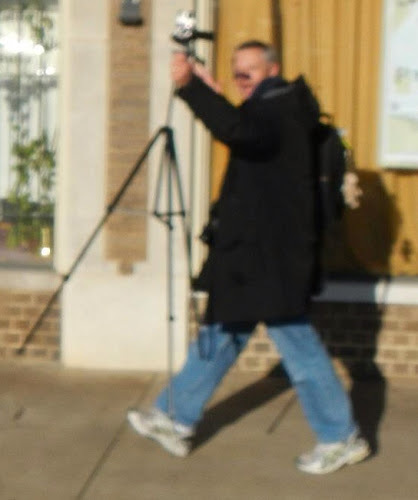 I never took my camera or phone out of my belt. He should charge for the service. I was having no problem keeping up with the 6 hour group, in fact I was ready to pass them. They were walking a bit too much and it was hard to start back up. Finally the elites passed us around 15 and when we got to the top of the large hill at Mile 16 we left the 6 hour group and hoped they wouldn’t catch us. The rest of the course was downhill and then a flat out and back section. They even had a 20 mile spectacular! There was a cute little girl who kept making her way around the course. She had a sign that said Official High Five Station. So cute and so energetic all morning! 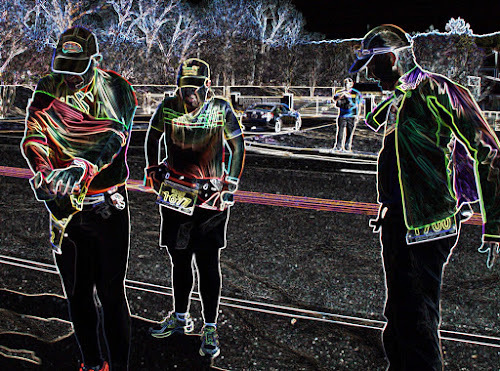 Around mile 22 I was starting to feel the lack of training and the whining began. Michael and Eddie were both great. They kept saying I was doing great and looked good, even though I knew I didn’t! We had one more big hill and Michael jokingly pushed me up it. We were really having too much fun. I know if they weren’t there I would have stopped running and just walked it in. They were great motivators. I also got my favorite thing on the course, BEER! It was great and Eddie and I did a quick toast. Soon we were approaching the finish and I couldn’t have been happier. We ran in to big cheers. We were in the thick of the finish since we started with the early start so we were finishing with the 3:45-4 hour group. I have never done that before. Bart Yasso was calling everyone in and I got a big high five from him. Eddie hung back and videoed Michael and I crossing the finish. It was a great finish. 5:50:01. I was surprised I broke 6 hours with the injury. I was thrilled and shocked. We got our medals. We about broke our necks from the medals! They are HUGE!! They weigh 2.5 lbs! Love it! Great post race snacks and organization. 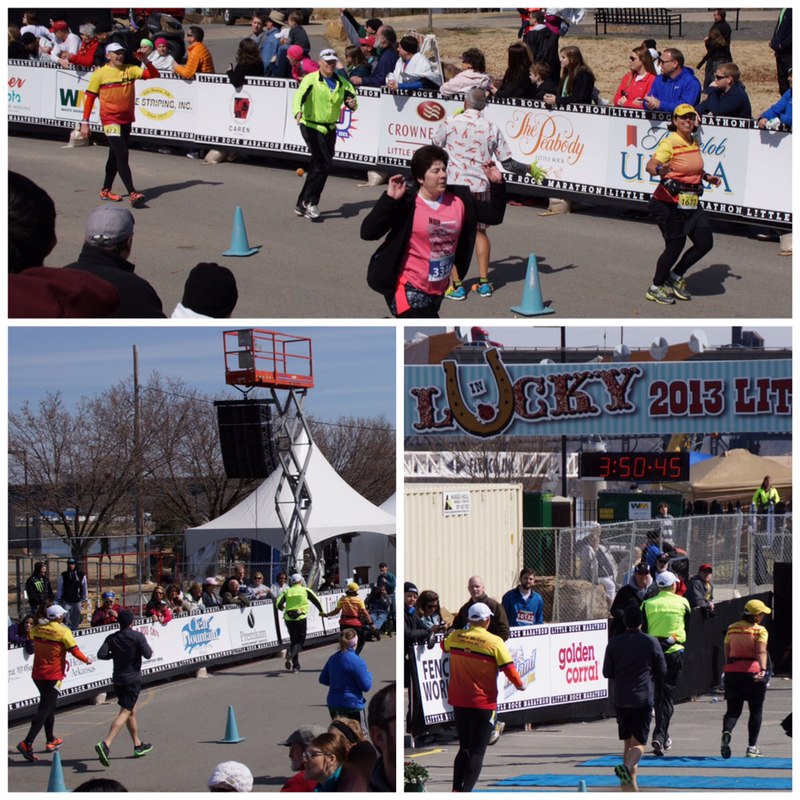 I highly recommend the Little Rock Marathon to anyone. This is an especially good one if you need more time than most. You can have up to eight hours to finish if you need it. 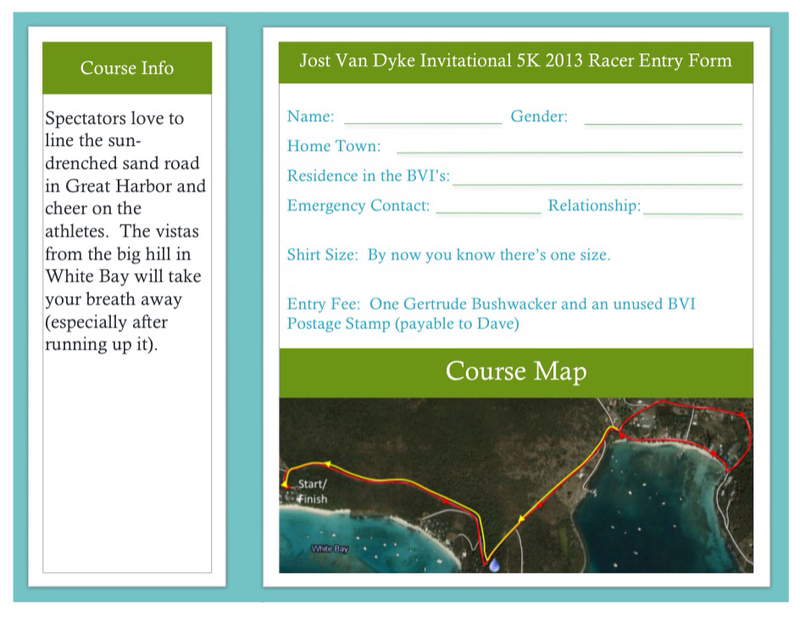 Great organization, nice course, and that medal! Big thanks to Eddie and Michael for making my day so much easier than it would have been. I had an awesome time with you both and hope to do it again sometime! Bigger thanks to Dave for getting up so early to move the car so he could drive all around Little Rock and follow our group to cheer us on. He was a great cameraman and also was kind enough to keep taking our disgusting sweaty clothes we were taking off as it got warm. Love you!!! There are two videos for your enjoyment. First is our typical race video (now with GoPro added into the camera mix) and the second one is Eddie's video. Following these videos are Dave's comments. Enjoy! 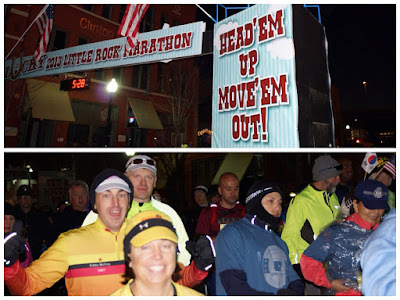 2013 Little Rock Marathon from Eddie McCoy on Vimeo. At the expo they said the course wouldn't close until the start of the race. I needed to go through the start area to get to a parking lot that was not surrounded by the course. I made it most of the way, but then met some unmovable barricades. I 3-point turned it to find they barricaded me in from the other way. A volunteer let me out of that trap but I had to get out of the car and free myself a block later. I was a little late making it to the Perks Tent to meet the gang, but I did ok. After the start I hung out in a Courtyard by Marriott near the start line for a half hour. Bathrooms, fireplace, and free decent coffee. Once I drove away from that general area I was in some of the not-so-fine parts of Little Rock. At least it was Sunday and most folks were still sleeping or in church. I was able to park the car and walk to three spectating areas. After that I had to get to my next spot fairly quickly. I came close to getting air in the Ford Focus rental car - kinda like what you see in car chases filmed in San Francisco. Mile 13 was near the State Capitol building and I parked in a reserved Senator's spot. No snacks yet. It seems my route would take me mostly through neighborhoods. At mile 19 I talked to the cop stationed by me and I asked about getting back into downtown. He said "good luck". Once I saw the crew at 19 I bolted for downtown via the highway. I did find a McDonald's along the way and stopped for an ice cream cone. I took the highway right into downtown and had no trouble getting back to our hotel. I dropped off their disgusting sweat clothes and went to the Perks Tent for about 45 minutes to drink some beer, eat pizza, and listen to the band (thanks Eddie). 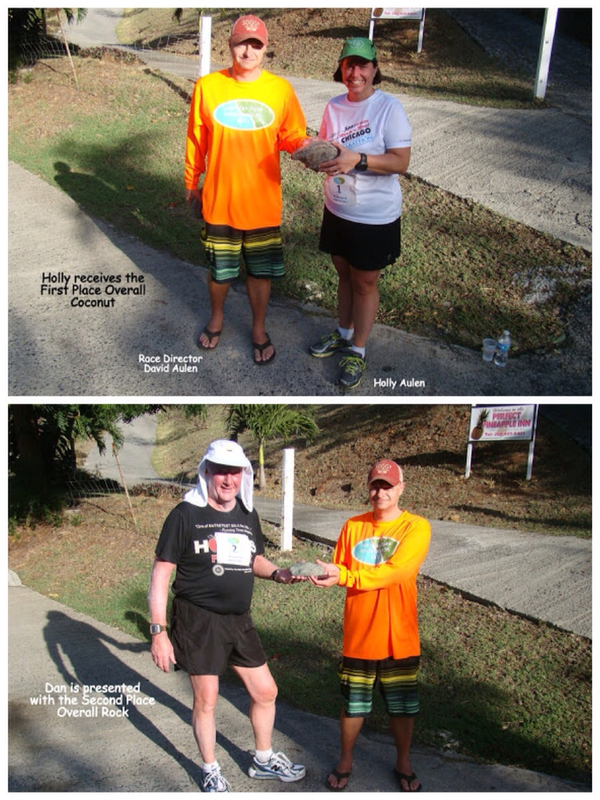 After that, I walked to the finish and watched Holly, Eddie, and Michael cross the line. 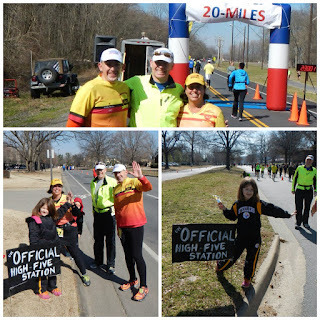 Overall a decent spectating day: 9 total spectating points (take that ever-present high-fiver), free decent coffee, relatively easy navigation along the course, and a National Park (Central High School). 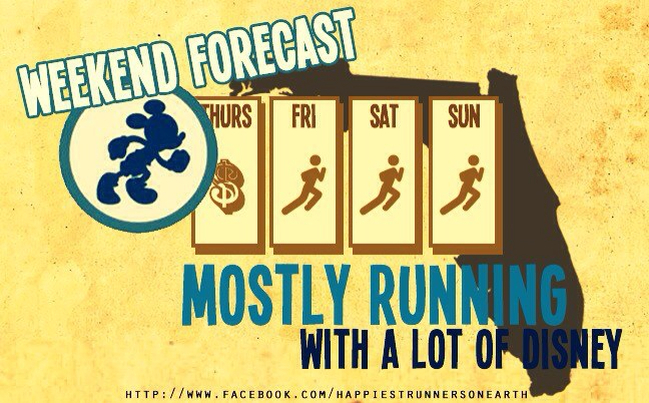 Disney World's Marathon Weekend is always a busy and hectic few days for us. 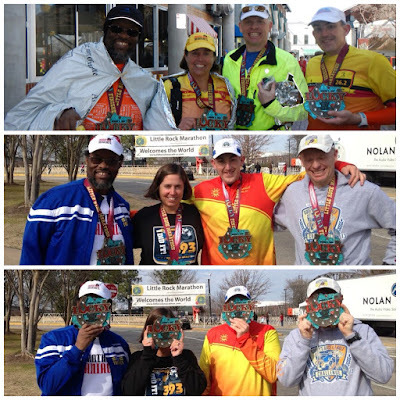 We've covered all the races in previous posts, but we didn't cover some of the other things we did during that trip. This was our first chance to see the new Fantasyland attractions (that were not part of the earlier Storybook Circus opening). We started with Enchanted Tales with Belle. Great details throughout the queue and inside Maurice's cottage. The show was very good and we may have misted up a little watching the little girl playing Beast dancing with Belle. We tried LaFou's Brew from Gaston's Tavern (tasty, but not a "can't-miss" for us). 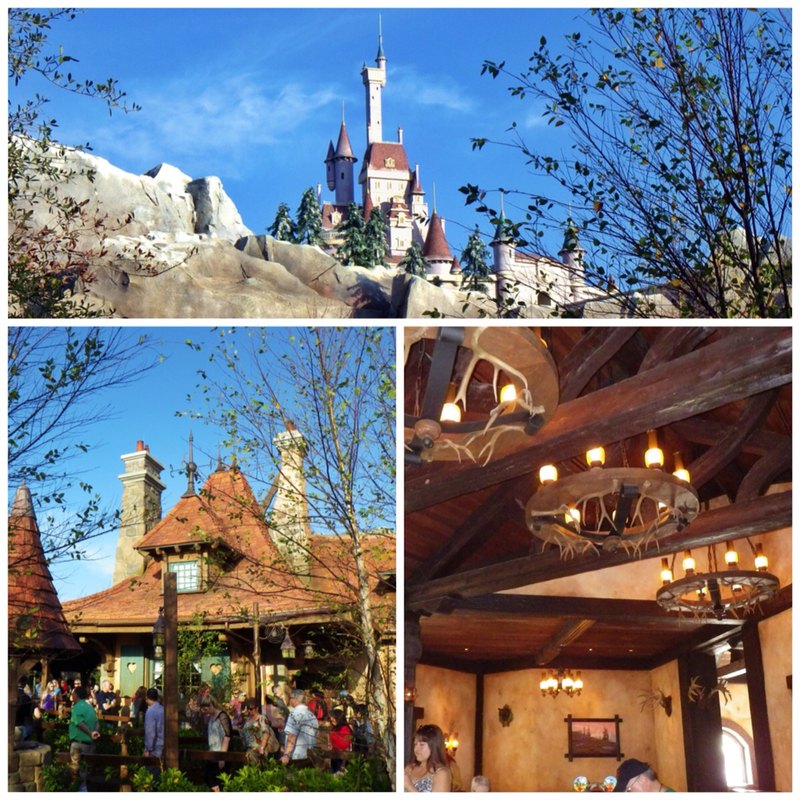 We enjoyed the new Journey of the Little Mermaid ride as well as our lunch at Be Our Guest Restaurant. We waited about a half hour in line for a counter service lunch. There were a lot of characters on all the race courses. We also stopped for a few other photo opps. We went to the character meet in the circus area. Here Mickey's friends are dressed up like circus acts. By The World Showplace entrance (near the UK Pavilion) they had a few characters hanging out. 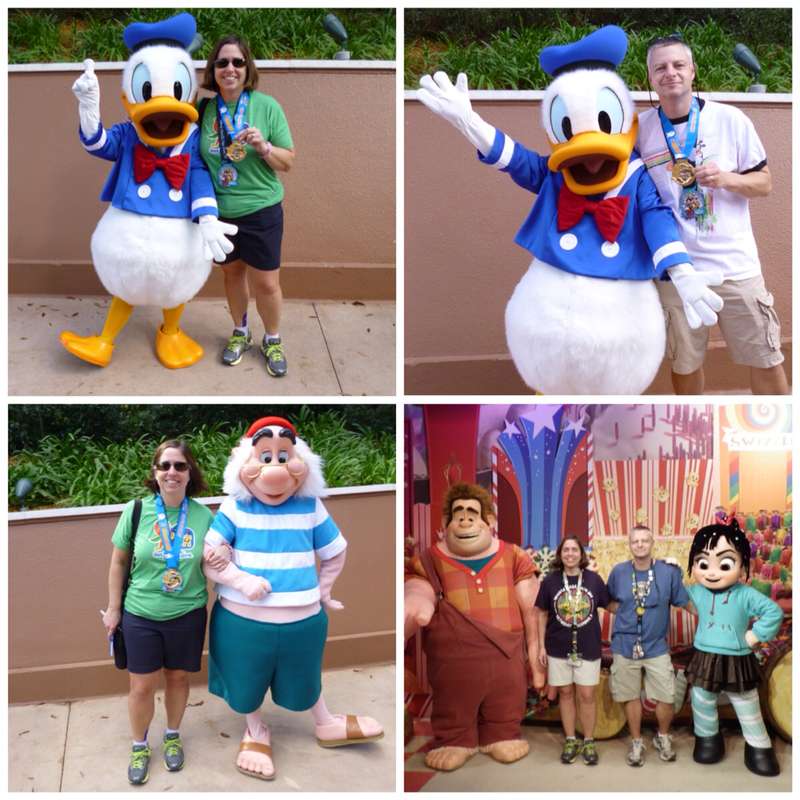 Since this was the afternoon after the half marathon we visited with Donald to get a picture with our Donald medals. Holly also got to meet Smee. In the Studios we met up with some characters from Wreck-It Ralph. We know; the horrors of that heading..... We wanted to rest up some the day before the half marathon. We drove to the town of Winter Garden to visit the store Theme Park Connections. It's a large warehouse that combines flea market with Disney's trash bin. You can find old employee handbooks, Disney magazines, old awards (with names of recipients on them), movie props, ride items, blue prints, etc. lots of fun but smells like your grandpa's attic. We purchased a "Dave" cast member name tag, a Peter Pan Imagineering pin, and a Disney Magazine issue from WDW's 25th anniversary (the year we first went to WDW together). After that we drove to the town of Celebration. This is a Disney created planned community. Lots of parks, nice houses, shopping, and dining. 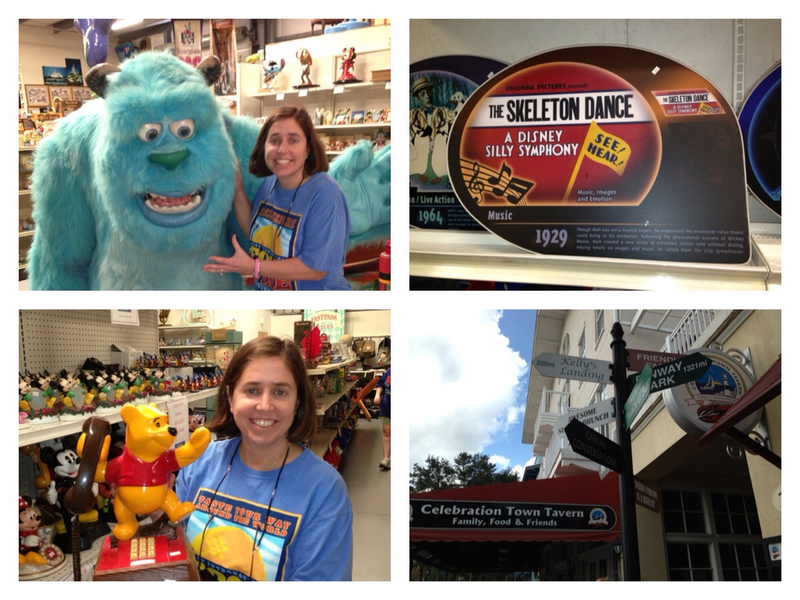 We had a good lunch at the Celebration Town Tavern. Of course we had our share of decent meals. We started at The Yacht Club. It was good, not great. 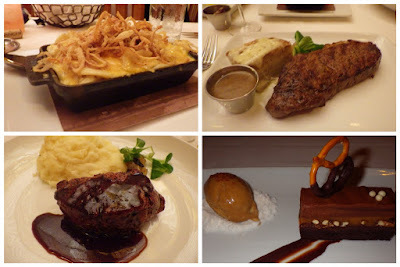 Service was off and the steaks did not measure up to Jiko or California Grill. We enjoyed the Mac and Cheese side dish and pretzel-based dessert. We had two trips to The Polynesian for food. Breakfast at Kona was requested by Dave so he could have some Tonga Toast and real pressed-pot coffee. 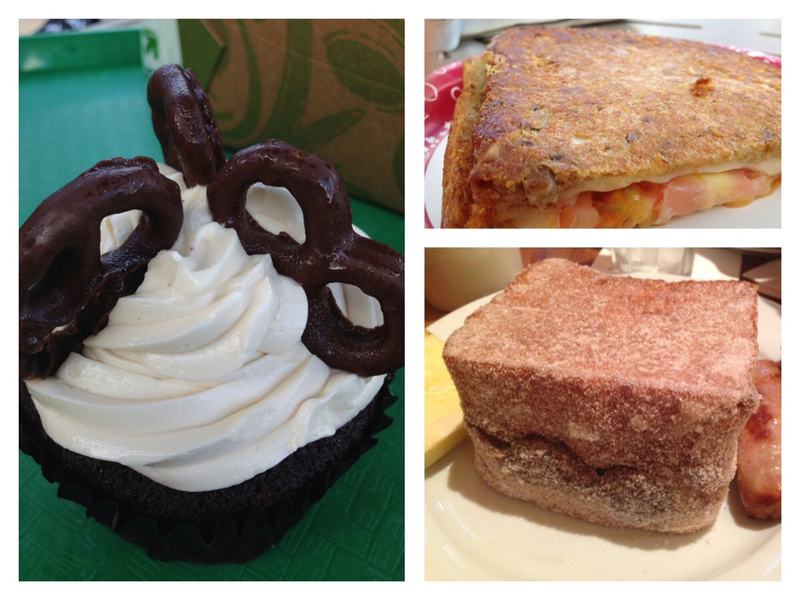 Later for lunch we shared the grown-up grilled cheese and a beer cupcake. The cake was good but we can't say we really noticed the beer. We had great dinners at Tutto Italia, Flying Fish, and Mama Melrose (no photos from any of those). 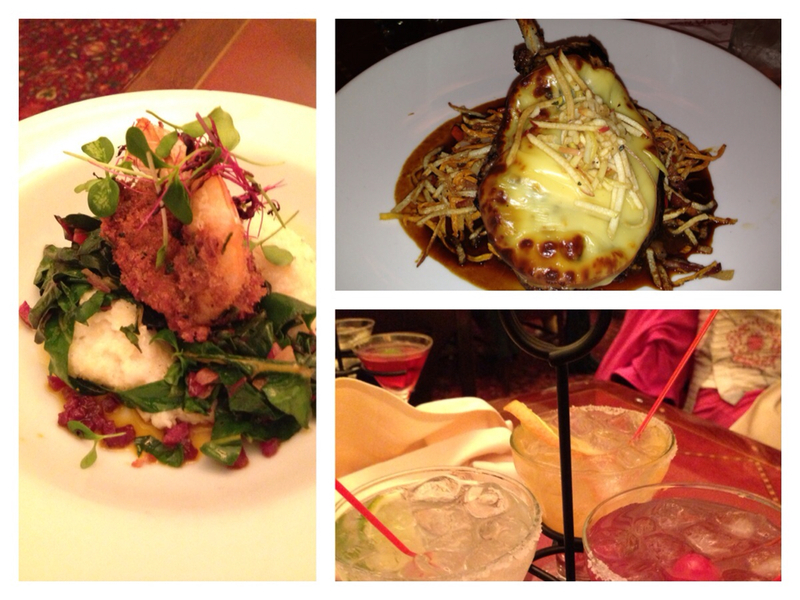 We also enjoyed a nice dinner at The Brown Derby. Pictured are a shrimp and fish dish, the pork chop dish, and a margarita flight (with a martini flight in the background). 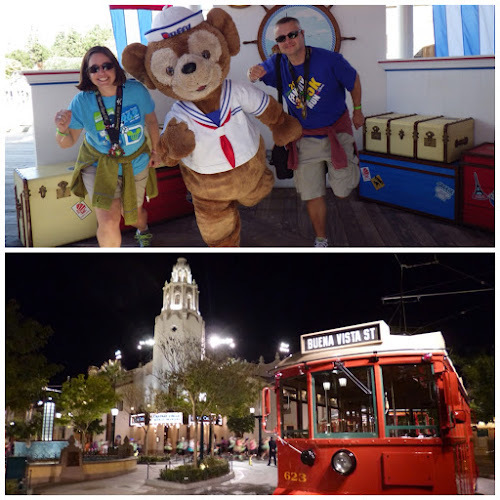 There were multiple visits to La Cava de Tequilia, The Rose and Crown Pub, Japan for the Kirin with a frozen beer topping, and Bellevue Lounge at The Boardwalk. We learned from our friend Anna you can get a glass of prosecco a few dollars cheaper in Italy vs. getting a glass of champagne in France. We spent a lot of time hanging out with friends. Some meetings were planned, others weren't. We had a great time seeing our long time friends Faye and Jim; especially watching Jim run his first marathon. We ran into our friend Laura in the Studios and ended up combining our ADRs at Mama Melrose for a fun pre-race dinner. 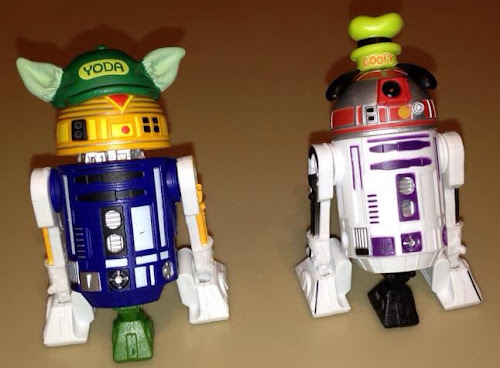 While with Laura we built our own droid action figures in Tatooine Traders. Watching Yehaa Bob is always a good time - especially with 100 other people you know. 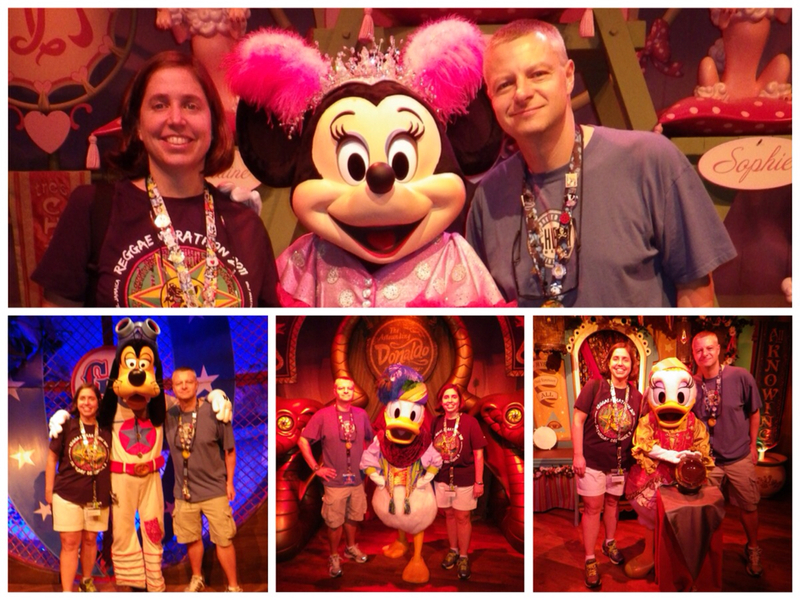 Overall another successful Disney trip. We shot some video of stuff during non-race events which may make it to a later post. 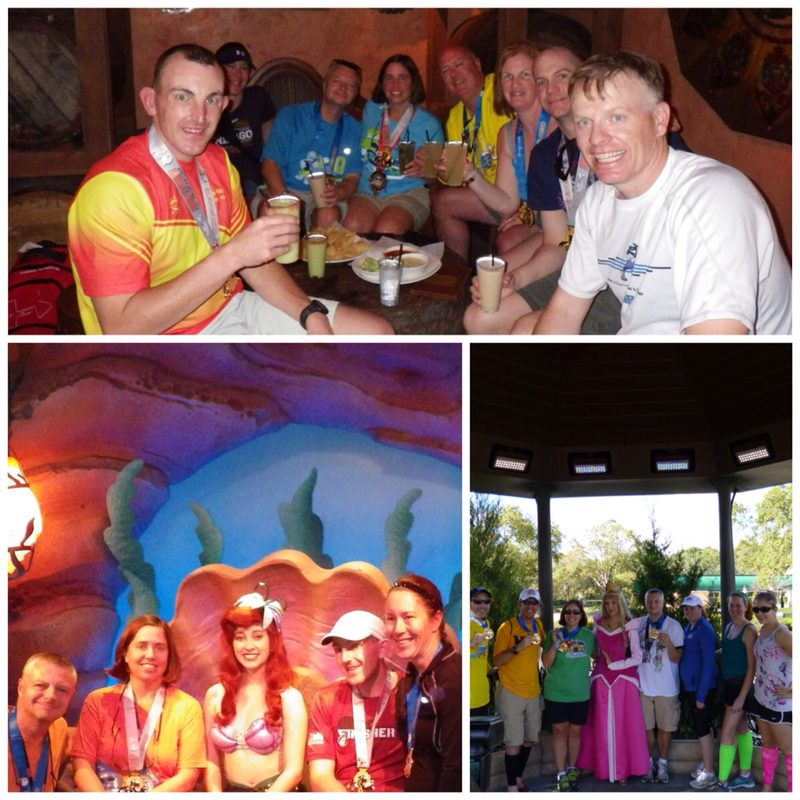 If you have been following along the past few months you know that January was a very Disney month for Team Tizzel. We had Disney World's Marathon Weekend followed by Disneyland's Tinker Bell Half Marathon. 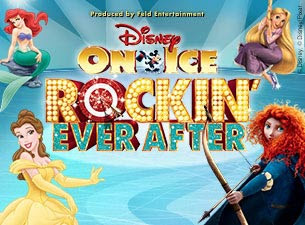 A few days after landing back home from California we went to see Disney on Ice "Rocking' Ever After" at The Allstate Arena in Rosemont, IL. Dave was skeptical about the experience while Holly thought it would be a good show, but maybe not great. We debated on what tickets to get. Do we get some higher-up seats to get the full view of the ice, or do we sit up close? We ended up getting ice-side seats which put us 6 feet from the action. Dave expected "hockey walls" to be up, but there weren't any. This was also a big merchandising opportunity. Tables were setup all along the arena lobby and there were lots of walk-around vendors. Disney park merchandise is lower priced than items sold here, but these items came with a 2-year warranty. The basic premise was this would be a "rocking'" show. Some hit songs, like Vogue, we're integrated into some of the routines. The Fab 4 (no Pluto) came out with the ice chorus line, did a number and some shtick, and then introduced the first of four stories. In between each story was another little skit by Mickey or friends. Stories for the evening were The Little Mermaid, Tangled, Brave, and Beauty and the Beast. The entire show was just under 2 hours. Overall we thought the show was good. Dave remained engaged the whole time, mainly because someone wiped out the first minute so there was potential for more. There were a lot more skaters in the show than we imagined. 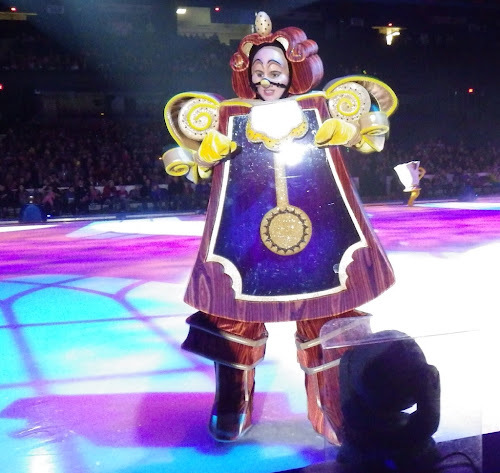 We thought that some of the princess parts were played by one skater, but we turned out to be wrong. Each story had their own male/female lead skater. The one scary thing about ice-side had to do with the other audience members' kids. Folks next to us we're not keeping their kids still and there were several times the kids were one step away from being on the ice. The usher gave us a look at first, but we were quick to point out those were not our children.